Black tea with rum-soaked raisins. Sweet rum flavor perfectly goes well with milk. This is a remarkably smooth and well-balanced black tea. The base is robust and bright flavored without being overly assertive. The flavors of rum and raisin lend a pleasing sweet flavor to the cup without being overwhelming. I like how this tea plays upon the palate. It is full-bodied and has a delightful flavor. It reminds me a lot of bread pudding – sans the custard and cake-y bread flavor. To heighten the flavors, I suggest adding a small amount of sweetener. 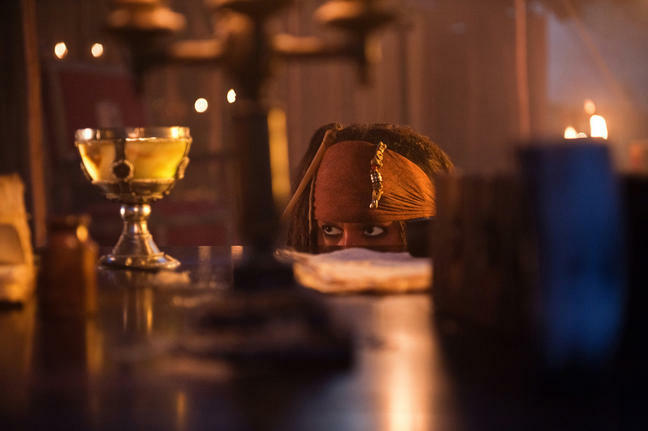 It brings out some of the sweeter qualities of both the rum and the raisin, as well as highlight some of the caramel-y undertones of the black tea. 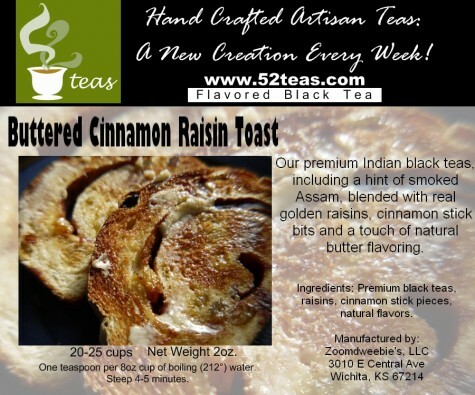 A splash of milk or cream will give this tea a creaminess that is similar to the custard-creamy taste of bread pudding. Pair the tea latte with a shortbread cookie, and you’ll have a yummy, deconstructed bread pudding! Compare our whole berries in our tea temples to the crushed up bits in your regular tea bag; whole is best. Slow and lifeless. The antioxidants in our super fruits will help stave off “Squashed Hedgehog Syndrome” (i.e. “feeling run down” – get it? Sorry). 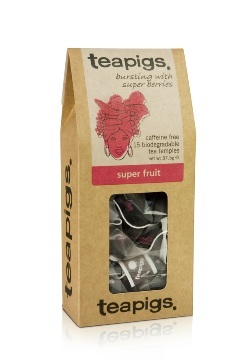 To buy our super fruit herbal tea packed with berries online, select the quantity of loose leaf tea, temple teas or sample tins you would like and then add to basket. One tea temple per person, infused in boiling water for at least 3 minutes. Don’t rush – just relax and watch the berries swirl. Write an online review and share your thoughts and tastes with others. I’m not sure what made me think of that phrase…maybe it was me reminiscing of a friends cat the other day…her name was COLOR ME RAINBOW…anyhow…on to the tea review, eh!? I really thought this was going to be pure hibiscus! I’m glad I was wrong! I could taste mostly elderberries and currants and then the blueberries sneaked their way in! THEN there was the slightest hint of cranberries towards the end of the sip! VERY interesting! The website said this has raisins in it but the wrapping doesn’t mention it…just for the record I cannot taste raisins. The Hibiscus is accompanying the berries but really isn’t much of a tangy and/or tart factor in the taste. It’s more fruity and berry like than hibiscus…thankfully! This was very good! And it totally surprised me! Nicely done TeaPigs! to this assortment of soothing herbs and delectable fruits. Ingredients: Organic hibiscus, raisin, elderberry, blueberry, strawberry, mango, raspberry, natural organic extracts of strawberry, vanilla and cherry. This is my 3rd Trump Tea and I must say I am overly pleased with Trump Tea as a whole! 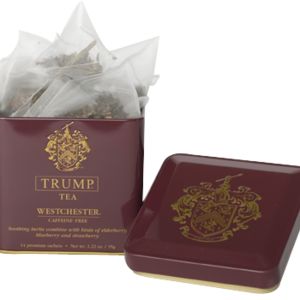 As for Westchester Tea from Trump Tea the aroma of the dry blend – prior to steep smells like Blueberry, Strawberry, and Raspberry. Once steeped I can smell the Elderberry, Mango, Cherry, Strawberry, Blueberry, Raspberry – in that order as I sniff. From a distance (across the room as a matter of fact) this smells like a fruity candy! The color – once steeped – is a Purple/Red and very vibrant! I can taste the flavors in this order – Blueberry then Strawberry followed by Raspberry and Cherry and the Hibiscus jumps in and then jumps out (just enough to say HELLO) and then moves on to Elderberry and Mango…the Vanilla and Raisin flavors are subtle and add more to the aftertaste than anything else. This bagged tea is jam-packed with ingredients and they all seem to mesh well! There is so much going on it thankfully overpowers the hibiscus and makes it tolerable. Many of you know how Hibiscus is usually a turn off in teas for me but NOT in this! It works and it works VERY well! The Strawberry and Hibiscus pops out more in the ICED Version. I like the Strawberry notes but think overall I like the HOT over the ICED because of the lesser Hibiscus flavors in the HOT…regardless this is still pretty darned yummy! I’m very pleased with this one and very surprised I like it as much as I do! 3 for 3 for me on Trump Teas! If you’re a fan of Golden Yunnan then you’ll be a fan of her little cousin Hong Jing Luo. 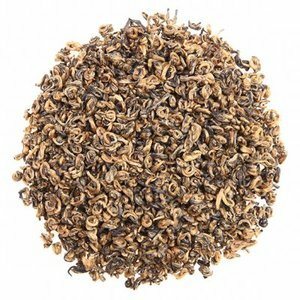 The name loosely translates into the golden soft downy feathers, its young loosely rolled black tea with golden tips is reminiscent of the finest Chinese black teas. Great morning tea to get you started with your day, goes well with milk or try it with brown sugar. 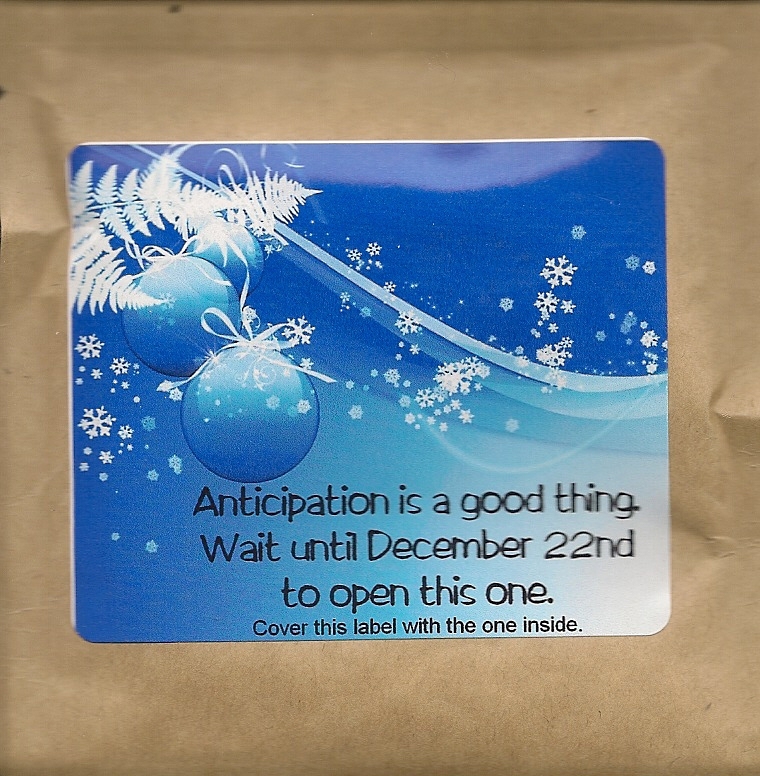 For the 1st infusion it tasted a little like cocoa and a rich-semi sugary. It reminded me of a Raisin-taste…almost like the raisins in a sugar cookie and CRISP. It has a very nice scent! I smell…sweet potatoes, YES, Sweet Potatoes! It’s an interesting taste, indeed! Maybe more like sweet potatoes with brown sugar. And it’s still crisp and sweet! After the 2nd infusion cools for a few minutes (at room temperature) I can taste a slight woodsy yet sweet taste at the end of the sip and into the after taste. This is a very unique cup of tea! That gets points in my book! And it tastes good too! VERY Memorable!